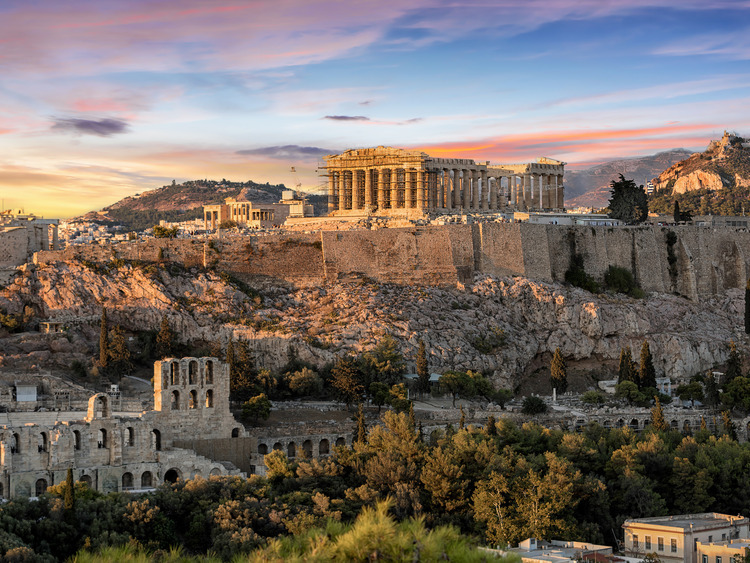 An excursion through myths, history and art: from the Acropolis, the sacred city of ancient Athens that is home to archaeological remains of rare beauty, to Cape Sounio, a picturesque promontory that commands magnificent views of the stunning ruins of the Temple of Poseidon. We travel by coach to the first stop on our excursion: the majestic Acropolis, which dominates the city of Athens and attracts millions of tourists every year. We immerse ourselves in the evocative atmosphere of the monuments that bear witness to the glorious past of Ancient Greece. At lunchtime, we stop at a hotel for a lovely meal before continuing our tour to one of the true wonders of Greece: Cape Sounio. We arrive at the Attic headland that is home to the wonderful Temple of Poseidon, built under the direction of Pericles in honour of the god of the sea. According to the myth, Aegeas, king of Athens and father of Theseus, is said to have thrown himself into the sea, thereby giving the sea its name. The temple commands stunning views of the Saronic Gulf and the Cyclades: a feast for the eyes and the soul! It is strictly forbidden to bring large bags or pushchairs into the Acropolis. Visitors with mobility problems will be able to access the Acropolis using a lift. In the event of inclement weather, or for safety reasons, the lift may be closed without warning at the sole discretion of the local authorities responsible for the site. On reaching the archaeological area, visitors with reduced mobility will be able to partially tour the ruins by following a special route.